But there is also a lot of potential. You come in with a lot of fresh energy. Maybe everyone else has gotten a bit tired and bored, and you are the one who's shaking things up a bit. Your outsider perspective may be appreciated by some! Yes, a late arrival requires a bit of a different approach. But the party is by far not over. And isn't it just the best party - when you can show up on your own terms? Here is where you can read about how I found my way into ballet at age 37. Let me add that I am quite tall for a ballerina and my hip joints are not very flexible and their geometry makes it challenging for me to do anything to the side (turn out, side splits, seconde, passé). I was, however, lucky with quite flexible feet (they still need a lot more strength, though), a long neck, well, and long legs and arms don’t hurt either for lines. This is all saying that we all have something that makes ballet challenging, and other things that work well! After living in Munich for more than ten years, I and my son moved to Toronto in early 2017. It was kind of spontaneous, the original plan was to stay just for three months. That relocation gave a new direction not only to my whole life, but also to my ballet learning. Whereas in Munich, I was lucky to take all my classes mainly at one studio (if you ever pass through - make sure to take a class there! ), Toronto led me to hop around between different studios. During one of these hops, I got introduced to my now “main teacher” Simon Sylvain Lalonde. I started taking small-group classes with him, as well as private lessons. His approach is very “square”/disciplined, lots of technique work and strengthening, and it proved to be quite a boost for my ballet learning. More important, though, was that Simon gave me the chance to perform my first solo and pas de deux on stage. I never thought myself as performer, I was always happy with “just taking class”. But somehow I got curious, and maybe I was just ready to make that step. But it went even further. 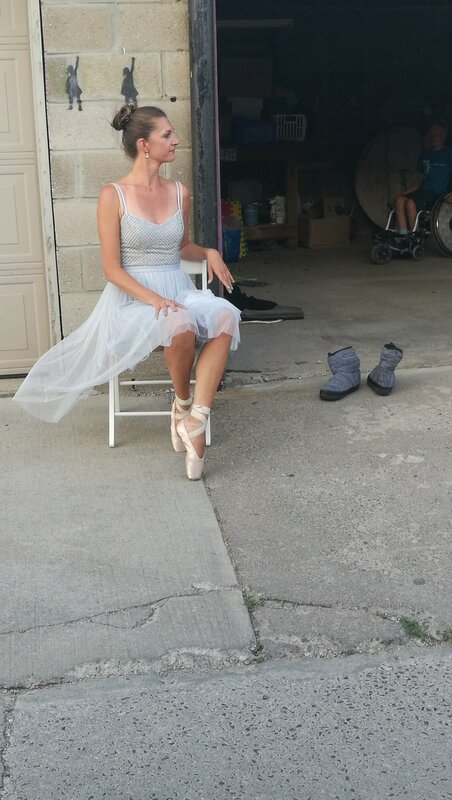 A week before the actual show, I had this crazy idea of performing my solo and pas de deux on the street. As a street performance. On pointe, on concrete. Just once, to see what it would feel like. Well, it got me hooked. Next thing I knew, I choreographed my own solo, and street performed it four times in Munich over the summer of 2018. And once more in Toronto after we came back in the fall. These performing experiences on stage and on the street definitely made me realize how much I love performing. I never would have thought. Interestingly, my street performance also made more money (per minute) than I have ever made with anything else. So in a way, you could say I morphed into a professional ballerina by creating my own stage. So this is what I want to encourage in you. Don’t limit yourself to what you can or cannot be at your age. Listen to your urges and desires, and work smart. Allow yourself to discover that you can shine and take a stage. That your body will follow your aspirations when you give it what it needs. And this is exactly what brought me to create Late to The Party Ballet. It can be challenging to build the ballet body from scratch, as an adult. It takes more than attending classes. You need to build very specific strength, new movement patterns, and increase your joints’ range of motion. And this is where this blog comes in: It’s meant to give you the knowledge around your body, how to train for the adaptations you are trying to achieve, when to take off, how to prevent overuse injuries, what biomechanical principles govern the placement of your body. I am also throwing in latest evidence around neuroplasticity, and how emotions and your mindset affect learning ballet. I am so happy you made it to the party! Enjoy the dance :-) And make sure to follow along on Instagram or by subscribing to the newsletter!